Picture your church as a place where the priesthood of believers finds its expression in creative and powerful ways. Picture leaders and staff equipping and unleashing people to minister in ways consistent with how God designed them. Think of the effectiveness, vitality, and contentment that come when the body of Christ nurtures itself through the healthy give-and-take of each member. 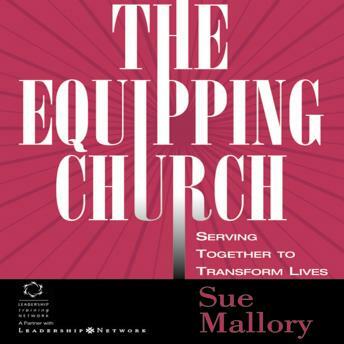 In The Equipping Church, Sue Mallory describes the benefits, the structure, and the culture of an equipping church and shows how your congregation can become one. This book is about limitless possibilities. Think 'vision.' What might your church look like if its members became vital, fully empowered partners in ministry? How can you help them discover and release their full potential? How would their roles change--and yours?AN EQUIPPING CHURCH IS A CHURCH WHERE:* pastors and leaders enable church members to share in ministry* people's gifts, talents, and life callings are matched with areas of service* ministry opportunities are recognized and developed* the culture encourages the growth of a broad array of ministries*a well-designed system addresses needs of every kind, both individual and corporate*the pastor doesn't have to be all things to all peopleUnpacking insights and principles uncovered by Leadership Training Network over the last several years, Mallory helps you customize an equipping system and culture in your church. You'll proceed from preparation (what you need to know), to foundations (what you need to change), to construction (what you need to do). In the process, Mallory takes you inside the story of her own church, Brentwood Presbyterian, to observe the different stages of their trial-and-error journey and how it has transformed their approach to 'doing church.' See how they dealt with various concerns that arose along the way, and meet men and women whose lives have been changed because Brentwood took the ministry road less traveled.Each chapter includes a section of 'Equipping Principles,' questions for discussion and reflection, and a summary of different equipping churches from around the country. With the accompanying Equipping Church Guidebook, this book will be a mile marker in your church--and the gateway to a more effective and biblical approach to ministry.